The holidays are upon us, and that means holiday baking is here! Cupcakes are a fun addition to any party, and if you’re looking for a way to add pizazz to your cupcakes, here’s a simple yet effective idea. 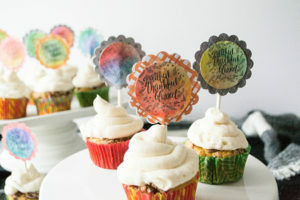 Watercolor Cupcake Toppers are cute, colorful and give your dessert an added pop. 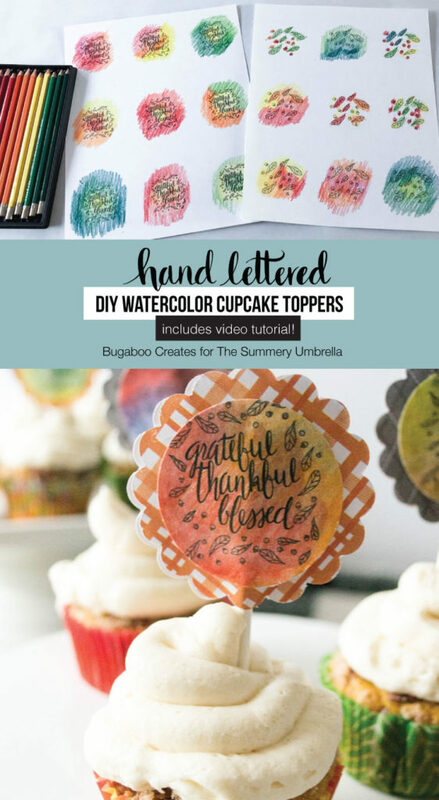 These cute watercolor cupcake toppers are a colorful and fun way to decorate your cupcakes. If you think your baked goods could use some flair, this is a super simple project to accomplish just that. Use your word processor or other familiar software to resize your SVG file. Make them small enough to fit your smallest circle punch. Mine are about 2 inches. 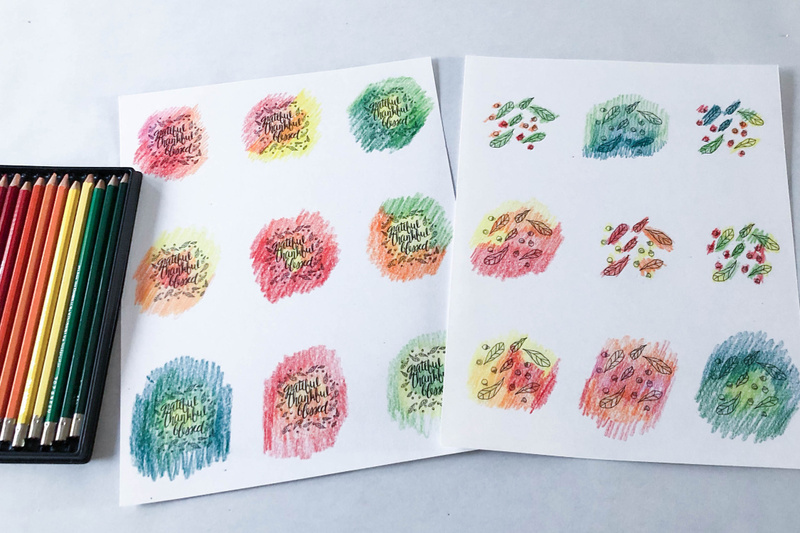 Use your watercolor pencils to color in your images. 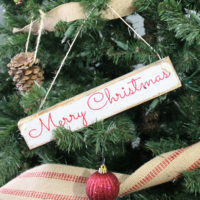 Use more than one color on each, as the colors will blend together for a nice affect later on. You can color them in any fashion you like. I did mostly ombre style with light to dark or dark to light from the center out. You can also color them starting in one corner with one color and color down diagonally to the other corner while switching colors. 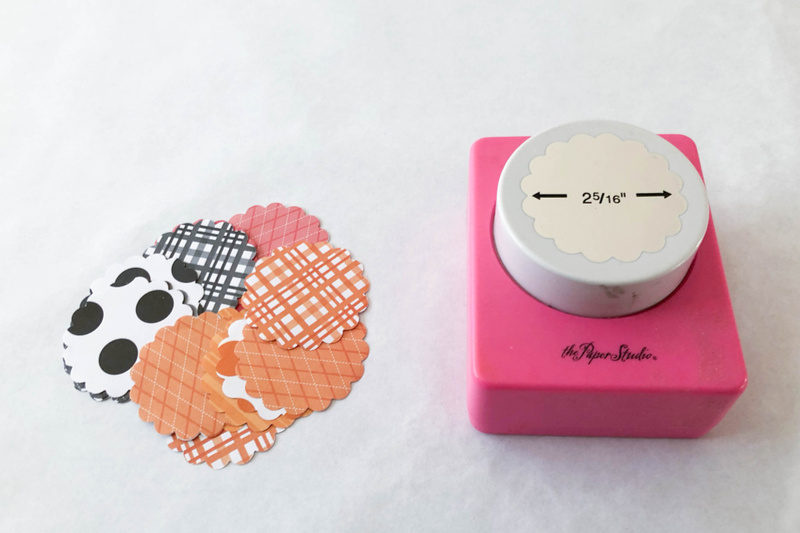 Tape your cardstock to your work surface. 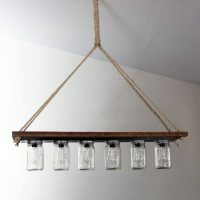 This will help your paintings to dry flatter. 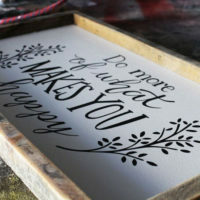 Once you add water, the paper will want to rumple and bow. Taping it along all edges will minimize this. Now you can begin the painting process. Fill your water brush with water. Lightly squeeze the barrel of the brush to moisten the bristles. The reason we’re using a water brush is mainly because it’s easier to control the amount of water you add to the paint (or in this case, pencil). Don’t squeeze the brush while you are painting or there will be too much water for the cardstock to absorb and it could pill. The ink from the images could run as well. 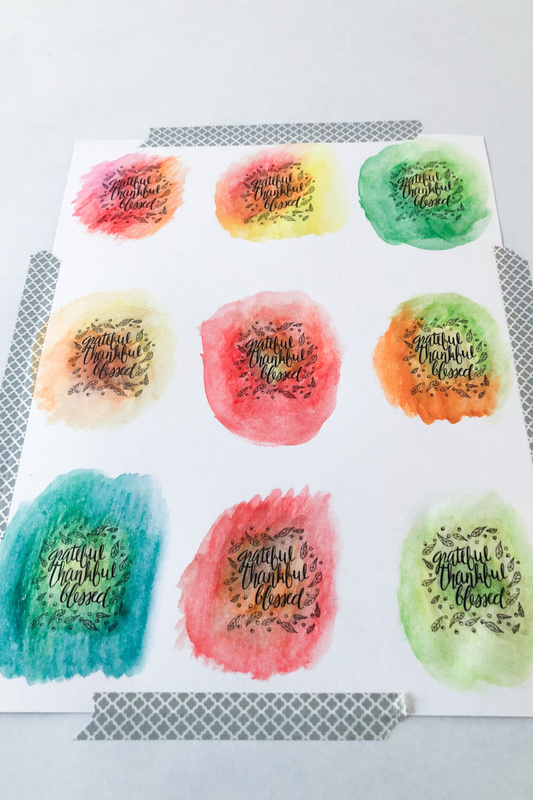 If the bristles become too dry and the colors aren’t blending well, lift your brush and gently squeeze while it’s not in contact with the paper. It’s a good idea to start with the lighter color and work to the darkest color as you are painting one of the small images. 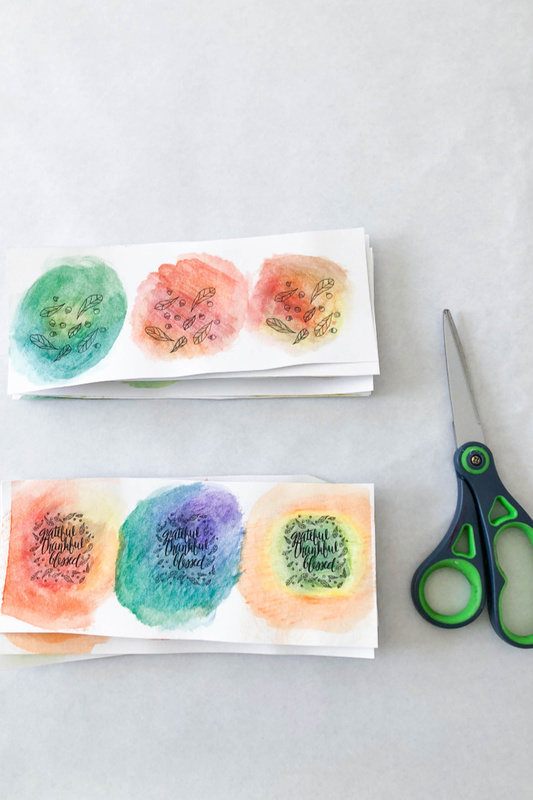 Once you’re done painting each separate image, you’ll need to cut your cardstock into strips to make it easier to punch with the circle punch. 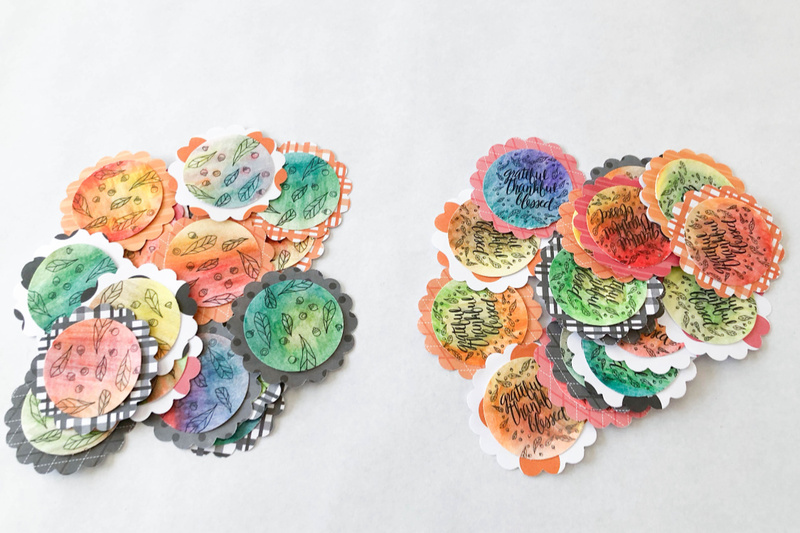 Now, take your circle punch and punch out each of your watercolor images. 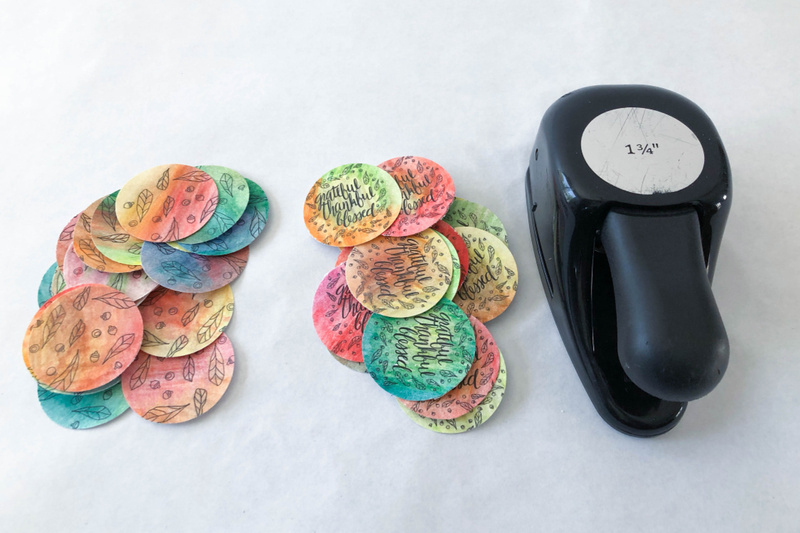 Then, take your scallop circle punch and punch a bunch of those from scrapbook paper. 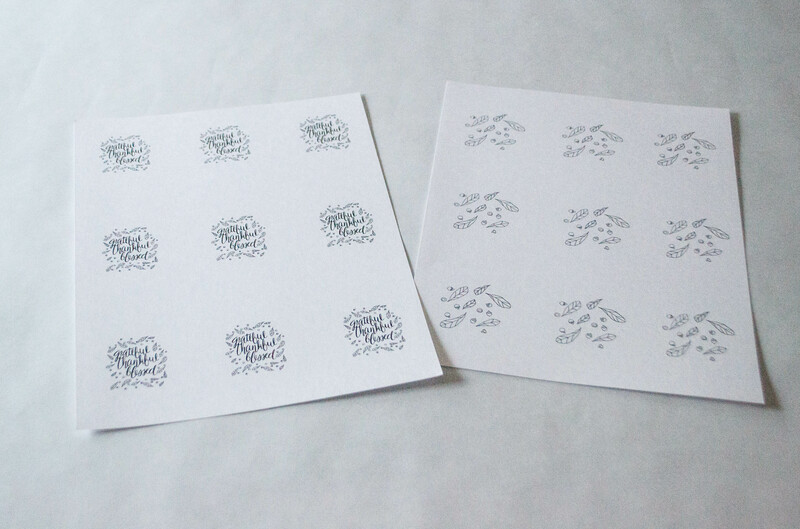 You can use any glue you like to stick your images to the scrapbook paper. I just used hot glue because it was already handy! 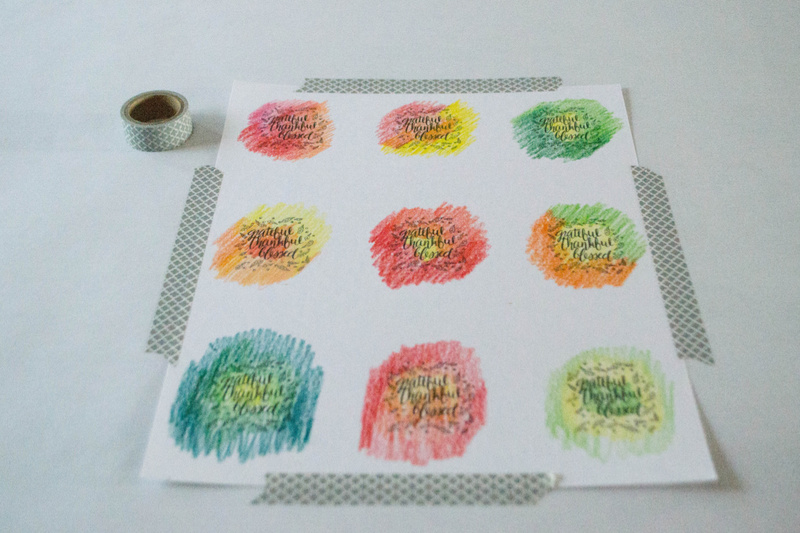 Attach your watercolor images to the scrapbook paper by glueing them together. Now you’ll add the lollipop stick. 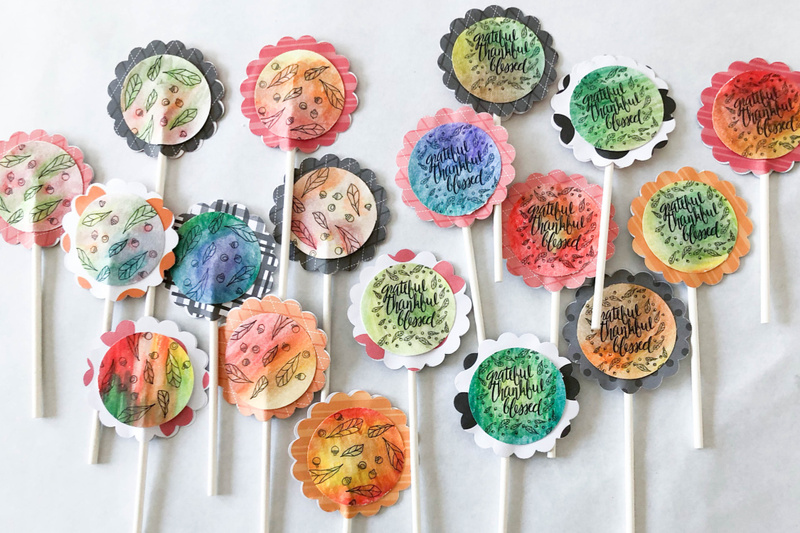 Apply hot glue to the back of the “Grateful, Thankful, Blessed” circles and lay the end of your stick in the glue. Then sandwich the stick between circles by adding a “Leaves and Acorn” circle on top. Finally, repeat! 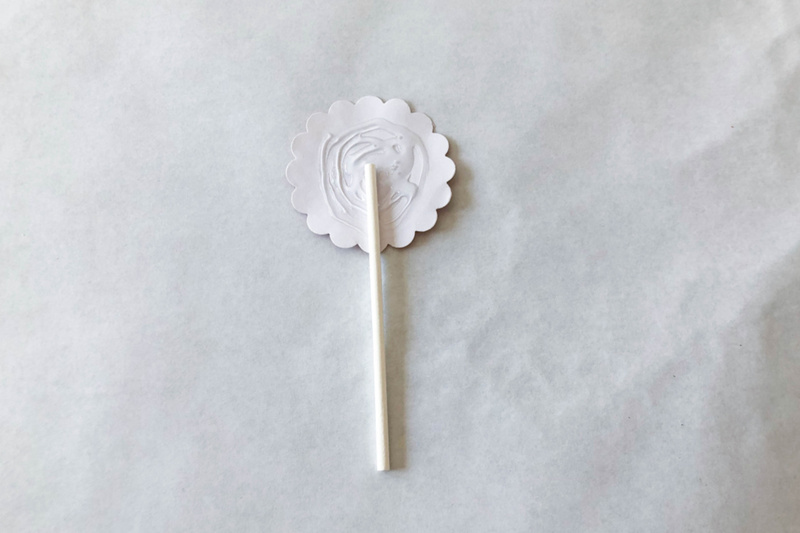 And you’ll have a bunch of fun little Watercolor Cupcake Toppers to artistically decorate your next batch of baked goods. 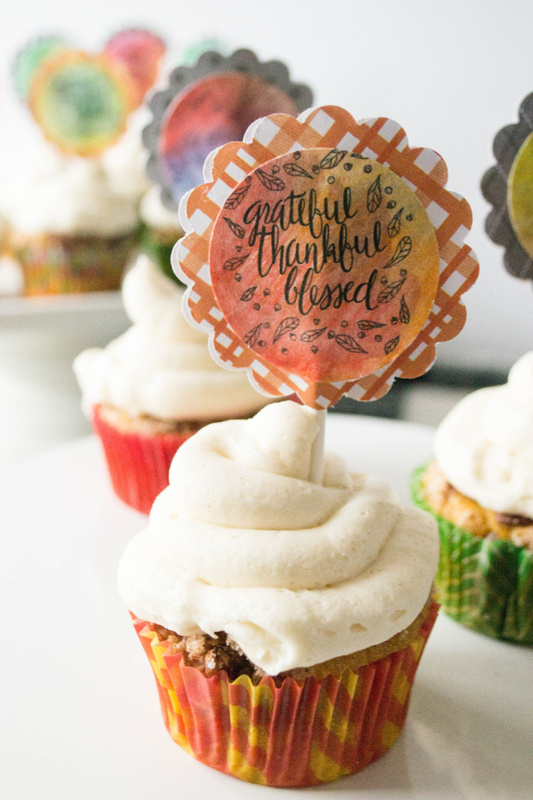 Pumpkin Spice Cupcakes with Pecan Streusel Topping and Whipped Cream Cheese Cinnamon Frosting. 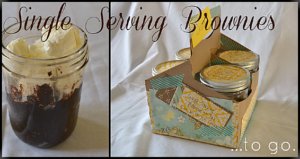 Single Serving Brownies To Go – A Gift.